You know what we’re talking about. There are just some celebrities who always wear way too much makeup and have their hair done up way too dressy for where they are. Then there are others that rival Joan Rivers with their plastic surgery escapades — and they’re only in their 20s! Unfortunately, we can’t round up certain stars and force them to submit to our “makeunders,” but at least we can tell you what we’d do if they let us. First thing on the list for most of them: a date with a makeup remover wipe (the plastic surgery will be a bit harder to reverse). Click here to see our proposed makeunders. Now, don’t think we’re picking on these lovely ladies. The opposite actually. All of them are so gorgeous naturally that we’re just baffled as to why they hide it with 10 pounds of hairspray and mascara. Expressing yourself creatively is one thing (and why we didn’t include Lady Gaga on this list, since over-the-top is her trademark) but constantly burying yourself behind a mask of makeup isn’t healthy. For your skin or your psyche. So let’s all take a breath of fresh air and see which celebrities are most in need of a makeunder — and what we’d have that makeunder be. Here are our picks, if we missed someone, tell us in the comments: Christina Aguilera, Lindsay Lohan, Taylor Momsen, Victoria Beckham, Heidi Montag, Miley Cyrus, Megan Fox, Kim Kardashian, Katy Perry and Gwen Stefani. 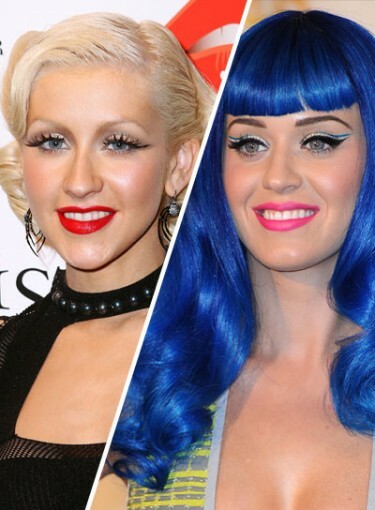 Click here to see our celebrity makeunders.